The LCC’s Love London, Go Dutch campaign has again featured on the BBC Daily Politics programme, again with Mustafa Arif fielding the questions. This time the opposing voice – instead of the incoherent Stirling Moss – is Simon Jenkins, who despite being a commentator on public space does little better in coming up with credible arguments. There’s very little dependency on the car now in London. We can see that the number of daily stages made by motor car far outstrips the number of stages made by any other mode of transport. Car use has been declining over the last decade, but to suggest that there is ‘little dependency’ on the car is, frankly, gibberish. The picture is even worse for outer London, where 50% of all trips (by main mode) were made by car or motorcycle between 2007/08 and 2009/10. Not so. Groningen, while by no means the size of London, is a city with a population of 190,000. It is not a ‘small town’. Nor was the footage taken on ‘small back streets’. It was – as far as I can tell – mostly shot in the city centre itself, particularly around the main railway station. Jenkins evidently has no idea what a city centre street can look like if you strip out a great deal of the motor traffic. The absence of cars and congestion does not automatically mean that a Dutch street is a ‘back street’. Yet more complacent ignorance. The real conceptual breakthrough will come when the great Hans Monderman, who wrote the great book on traffic, a true revolutionary, is taken aboard, as in Exhibition Road in London, the only example in London of Monderman’s theories. Which is basically you don’t endlessly separate. If you separate, you allow cars to go much faster. The most important thing is you create a pattern of a street in which everyone’s using it all the time. Traffic is slowed down – drastically, often. But you don’t try and separate. You make sure that people, cars, buses – whatever it may be – and cyclists police each other. And the extraordinary thing about it is – as in Germany, in Holland, in other places in Europe – accidents reduce. Speed reduces, accidents reduce, the street is safer. It’s hard to know where to start with this. Hans Monderman did not write any books. Exhibition Road is not the ‘only example’ of Monderman’s theories – there are a large number of new ‘shared space’-style environments across London, including Byng Place, Seven Dials, Long Acre and Sloane Square, to name but a few. Traffic on Exhibition Road – which is, it is true, subjectively a little slower than before – has not been slowed down ‘drastically’. It’s all very well talking about pedestrians and cyclists ‘policing’ the space to keep vehicle speeds down, but what you are in effect doing is asking them to play chicken with fast and often heavy traffic. Nobody wants to play, and pedestrians have separated themselves, despite the ‘pattern’ of the street inviting them to do so. Monderman himself, despite being an adherent of these types of road designs, was firmly of the opinion that separation – in the form of cycle paths and tracks – on surrounding streets was an essential corollary to sharing on a street with ‘open’ designs like Exhibition Road. Again, this is ignored by Jenkins, before he moves on to present another slice of evidence. Intrerestingly, the Dutch don’t wear helmets. Why don’t they wear helmets? Because they know it’s safe. And it’s been made safe by the way you grade the streets. These are often mechanical things you do, just to make it easier for all people to use the street. If you have endless lights, signs, and lanes, cars think they’re safe, everybody thinks they’re safe, when they’re not. The implication being that it is the shared space environments in the Netherlands that make cyclists feel safe, and accounts for their lack of helmets. Never mind that Dutch cyclists tend to be viscerally opposed to shared space (their organisation, the Fietsersbond, regularly writes critical pieces about it), and that shared space is actually found only intermittently in the Netherlands, where roads and streets are designed according to the principles of subjective safety. This point is made firmly by Mustafa Arif, who also notes that Dutch cyclists tend to cycle less in areas of shared space. Jenkins is, again, simply ill-informed. The most problematic thing in London is quite simply there are an awful lot of people using the street, and there’s no way you can ultimately separate them. What you must do is simply make them safer by slowing the traffic. This is a variant of the bogus ‘our streets are too narrow for cycle paths’ argument, which pretends that we cannot separate cyclists (and indeed pedestrians) from vehicles because there’s not enough space between the building frontages, coming this time in the form that there’s ‘too much traffic’ on the street. The argument is bogus and self-defeating precisely because London currently manages to accommodate vast amounts of private motor traffic, journeys that can and should be made in far greater proportion on foot and by bicycle. Again, Mustafa Arif makes the point that half of all car journeys in London are under two miles. There is space in London; it is just poorly allocated. It’s actually rather pleasing that the arguments against ‘Going Dutch’ are so weak and incoherent. More please. This entry was posted in Car dependence, David Hembrow, Europe, Go Dutch, Infrastructure, LCC, London, Modal share, Shared Space, Simon Jenkins, Subjective safety, The Netherlands, Transport for London, Uncategorized. Bookmark the permalink. I think you’ve summed it up fairly nicely in that last paragraph and it’s that failure in the logic of TFL and the street planners in London (heck the whole of the UK) that is so frustrating. The reason our streets are congested is because of the high volume of inefficient usage with single occupancy short car journeys. Unfortunately it is something of a vicious circle, people won’t cycle or walk as they don’t feel safe. So instead they’ll drive which adds to the perceived danger. The current government don’t seem to want to do anything to alter the status quo, as they see this as removing peoples free choice to use their private motor vehicle, by making it more difficult/less desirable to drive into city centres. Yet they ignore the fact that they are denying the self same free choice to those who WOULD cycle IF if felt safer. They instead stick to their cars and we have a negative feedback loop which seriously needs breaking. As for the rest of the post Jenkins seems so far off the mark it’s laughable. Yet again another “expert” who ignores the proven good practice the Dutch have developed over the last 40 years. I’ve only been down Exhibition Road once myself (enroute to The Big RIde) and I wouldn’t say it felt any safer then a normal outer London road, in fact I felt safer and more comfortable cycling on the backroads that restricted through traffic nearer my house. Laughed out loud at this one! It was only when I started reading foreign (I’m Dutch) bicycling blogs that I started to hear about this ‘great’ countryman of mine, Hans Monderman. Hans Monderman is a non-issue over here. Nobody has heard of him. HIs ideas were hardly implemented, and the few times they were tried (as everything is tried at least once in our on-going quest for the best solution to certain problems), it was discovered that they DIDN’T WORK and abandoned. Hans Monderman was a blip on the radar of the evolution of Dutch cycling infrastrutcture. Hans Monderman, in short, is a straw man. But why does this particular straw man keep rearing its ugly head? I mean, its not as if the ‘Monderman shared space as typical Dutch infrastructure’ straw man fallacy isn’t DEMONSTRATIVELY false. All anybody in London, be it politician or campaigner, has to do is to go to Victoria Station, hop on a train and voilá, you’ll be there in a couple of hours. Easy peasy! The Netherlands isn’t somewhere in East Africa or hidden among the Himalayas after all. Why do British politicians and campaigners keep on hammering on the ‘shared space/Hans Monderman’ fallacy? There’s another, even more frustrating (to Dutch me) part, and that is because Hans Monderman got mentioned, misinterpreted, quoted out of context etc., by certain ‘anti-separists’ and nobody could pierce through the arguments or reveal the fallacy because NOBODY SPOKE DUTCH and so nobody could research for, let alone READ the Dutch experts’ opinions on the Monderman concept, or even the writings of Monderman himself. There is, of course, a simple solution. You could learn Dutch and do your homework, OR (and this is such a no-brainer, I’m constantly amazed that nobody has thought of it) you could hire some Dutch experts. How do you think you can ‘go Dutch’ if you are not prepared to investigate how the Dutch did it? And I mean properly investigate, not googling for ‘Monderman’ and then throwing whatever you find through Google Translate. I mean, we are talking about millions, if not billions of pounds. A huge investment to ‘go Dutch’ and nobody has thought of the obvious: to ASK THE DUTCH WHAT THEY DID TO GET WHERE THEY ARE NOW?!! PS What Monderman is rightly remembered for is his ‘woonerf’ concept, which IS widely implemented, but this has hardly anything to do with cycling infrastructure. Is there any evidence Monderman created the woonerf? Most people credit its invention to town planners in Delft in the early 1970s. According to wikipedia, Monderman spent the 1970s in Friesland, hundreds of miles away. And surely shared space for residential and shopping streets (like woonerfs), where walkers and cyclists have priority over motorists in low-vehicle zones, should be central to how we redesign urban streets in the UK to make them safe for cycling? I thought Mustafa Arif did a tremendous job of skewering Jenkins’ Mondermann nonsense. I kind of agree with Marion above, shared space seems to be used as a way for planners to show they are considering the needs of peds and people on bikes and giving them what ‘they want’ (or a misrepresentation of what they want) without upsetting motorists. Yes, the popularity of the Shared Space concept in the UK is very curious. I think three nationally-specific factors have come together to bring this about, none of which has anything to do with Monderman’s original thinking at all. The first is what commentators above have pointed to: a desire to change, beautify and simplify the streets without really giving anything more to pedestrians and cyclists or really taking anything away from drivers, because of the perceived political difficulty of doing that. Shared Space in this particular British manifestation is a product of reactionary, right-wing thinking – a la Daniel Moylan, Kensington and Chelsea Tory, and driver of the Exhibition Road scheme – that rules, boundaries and restrictions need to be removed from streets, and that this will be an improvement because then a self-regulating “eco-system” will start to take the place of clutter and officious regulation. This argument collapses quickly, as we have seen, as people note that what it actually means is the weak (particularly the old and disabled) quite literally going to the wall. 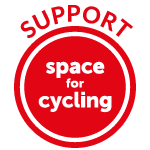 But a second factor is support for Shared Space from many in the UK cycling word, who have recognised that our streets need radical alteration to get more people on bikes, but who have been influenced by the long history in the English-speaking countries of mistrust of the concept of the segregation of bikes. This mistrust comes in part from the very low standard of engineering of most cycle-specific infrastructure in the English-speaking countries, but it goes further back than can be explained by this, to the early history of the motor age, when British cycling organisations got into a mindset that separation meant a defeat by the motor lobby in the battle for the roads, a mindset that has still not entirely vanished. For these people, again, Shared Space seems to offer everything, in its illogical contradictoriness: no separation, no loss of the right to the road, but lower speeds and lower sense of entitlement from motorists. If you put these two lobbies together with a powerful and respected architectural profession in the UK (much more respected than town planning, traffic or civil engineering) whose members think about streets in more aesthetic than functional, transport planning, or safety terms, you can, I think, easily see why you start to get results like Exhibition Road. So many cycle campaigners were telling me ten years ago how great Exhibition Road was going to be, and how this whole idea would trounce those out-of-date ideas about separating out forms of traffic, that people on the continent were all now rejecting. As Marion says, all anybody ever needed to do was to cross the North Sea and see what was really going on there, and what really works. This still holds true. Perhaps the message is starting to get through. I’d say: don’t believe self-appointed “experts” like Jenkins or Hamilton-Bailie, or even me, go there yourself and make up your own mind. David is of course right that there is no real alternative but to see it for yourself relative to all the other aspects of Dutch infrastructure design so that you can see for yourself what works best. I might have mentioned it before, but we do tours specifically to benefit pelple who want to see not only Shared Space but also all the other, more successful, things which have greatly benefited cycling in the Netherlands. Marion is absolutely correct to say that Shared Space in the main “didn’t work”. In fact, on the last study tour we saw a good example of how it has remained problematic in that when we arrived to Haren, one of the flagship Shared Space projects often held up as a success, we found that a group of students was surveying passers by about whether they felt safe, and whether they avoided the area, while others were counting how often motorists gave cyclists their legal priority at junctions. There would be no project to do in the area if there was no problem. In the five years that we have lived in the Netherlands and experienced for ourselves how well different things work we have taken the time to learn the language (which takes a while and is still ongoing). We’ve cycled many tens of thousands of kilometres here in all conditions and across most of the country. We’ve read any amount of Dutch literature about cycle-path design and we’re trying very hard to pass on the knowledge that we’ve built up to campaigners elsewhere. However, there is still enormous confusion in the UK about what Dutch infrastructure is. Indeed, also about what “Shared Space” means. While Mustafa Arif spoke well against Simon Jenkins he appeared not to understand the very large differences between Shared Space – through roads with a 30 km/h speed limit, and Woonerven – residential roads not intended for through traffic with walking pace speed limit. It doesn’t bode well when those who are on your side don’t completely understand the subject. There are no secrets. You only need ask the right people the right questions to find out. However, to understand the context of the answer it helps enormously to have lived in both countries. 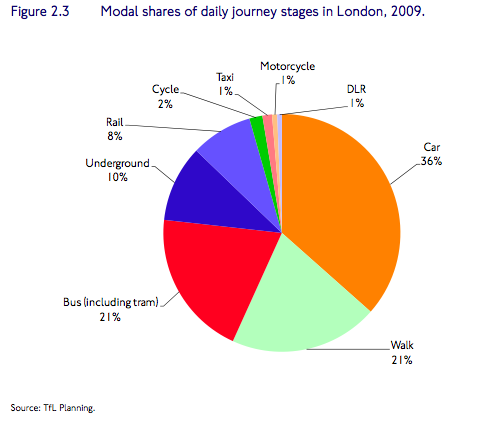 Surely that TfL pie chart massively underestimates the number of walking journeys in Greater London? I mean, every public transport journey involves walking at each end, as do many car journeys, not to mention the millions of people who actually walk somewhere every day. Defeatist arguments is what the anti’s present, really. I really think programs like Daily/Sunday Politics could do very well if they just gave a run down of the facts (like you’ve presented in your blog) – when people have the information they tend to be less grumpy about it and make informed choices or ask for serious change. “There’s very little dependency on the car now in London”. Well in a way he is right, people aren’t dependant on their cars, it is just that they feel safer in them than out of them. The trick is to make it safer and more convenient to use active travel rather than the car.